The Museum of Arts and Design (MAD) opens its new building at 2 Columbus Circle, inaugurating its space with four major exhibitions: Second Lives: Remixing the Ordinary; Elegant Armor: The Art of Jewelry; Permanently MAD: Revealing the Collection and Forward Thinking: Building the MAD Collection. The public opening is Saturday, September 27 and Sunday, September 28, 10:00 a.m.�6:00 p.m. Admission is free. For information, contact 212.299.7777 or log on to www.madmuseum.org. For the Museum�s opening, artist Jason Hackenwerth has created large wearable sculptures, known as Megamites, that will be featured in front of the Museum throughout the day. Created from latex balloons with a sophisticated construction technique, the artist and other performers wearing these sculptures will showcase the works with animated demonstrative performances. The opening of the new Museum of Arts and Design, designed by Brad Cloepfil of Allied Works, marks the completion of a renewed Columbus Circle, reintegrating the building into the life of the city. 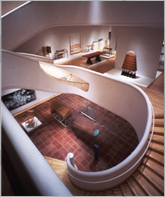 The 54,000-square-foot building offers triple the space of MAD�s previous facility, allowing the Museum to dedicate galleries to its growing permanent collection for the first time and to host an expanded program of exhibitions that will examine the craftsmanship, materials and processes of contemporary artists and designers from around the world. In its new special exhibition galleries on the fourth and fifth floors, MAD presents Second Lives: Remixing the Ordinary, a special thematic exhibition showcasing 51 artists from around the world who re-purpose and transform mass-produced objects into extraordinary works of art. On view in The Tiffany & Co. Foundation Jewelry Gallery on the second floor, Elegant Armor: The Art of Jewelry features over 130 works of modern and c ontemporary jewelry from 1948 through the present, drawn from the Museum�s collection of nearly 500 modern and contemporary designs. Presented in the permanent collection galleries on the third floor, Permanently MAD: Revealing the Collection marks the first time in the institution�s history that its most significant holdings will be on comprehensive view. Forward Thinking: Building the MAD Collection showcases outstanding gifts by many of the Museum�s loyal friends and supporters, significantly enriching its collection and ensuring that it will continue to grow in breath, depth, and quality now and in the future. The new Museum also features the permanent installation of several works, including a site-specific stained-glass commission by Judith Schaechter, an abstract ceramic wall relief by Ruth Duckworth, and a ceramic mural by Robert Arneson, titled Alice House Wall, on display for the first time in 20 years. Revolutionary interpretative tools designed by Pentagram, including exhibition interactives and a new online collection database, provide in-depth information on individual objects throughout the new Museum. The sixth floor, dedicated to education, features classrooms and studios for master classes, seminars and workshops. During the opening weekend, artists will work for the first time in the three, fully equipped studios. The artists will reveal the creative process of making three-dimensional art objects. Visitors will be able to observe and engage with the artists through the day. Lectures, films, performances and symposia related to the Museum�s collection and topical subjects affecting the world of craft, art and design will be held in the renovated 150-seat theater auditorium on the building�s lower level. On the ground floor, The Store at MAD is expanded significantly and offers a wide range of handcrafted, original works, both functional and decorative, and limited edition pieces created by more than 1,400 artists. The ninth floor accommodates the Museum restaurant, operated by Brian Saltzman in a joint venture with ARK Restaurants Corp. The 140-seat restaurant, scheduled to open in early spring of 2009, will feature 360 degree views of New York and panoramic views over Central Park. The restaurant will be open for lunch and dinner 7 days a week. The Museum of Arts and Design explores how craft, art, and design intersect in the visual arts today. The Museum focuses on contemporary creativity and the ways in which artists and designers from around the world transform materials through processes ranging from the handmade to cutting edge technologies. The exhibition program explores and illuminates issues and ideas, highlights creativity and craftsmanship, and celebrates the limitless potential of materials and techniques when used by creative and innovative artists. MAD�s permanent collection is global in scope and focuses on art, craft, and design from 1950 to the present day.